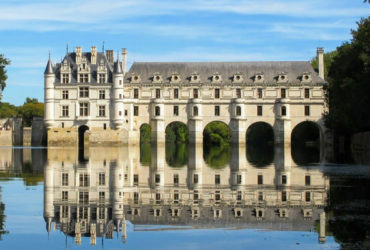 A part of UNESCO’s World Heritage, the Loire Valley is a living cultural landscape. With a great river, a fertile land and temperate climate, it is a privileged place. 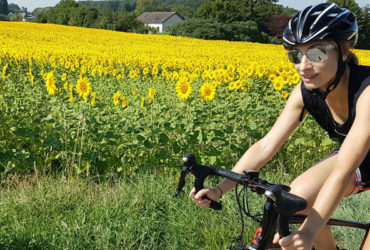 Its geography, history and natural sites make the Loire Valley an obvious choice for a cycling holiday! Castles, vineyards, rivers, typical and preserved architecture offer a variety of interests of a rare density. From the Cher to the Loire Atlantique, the Loire river runs through a long valley, offering great cultural diversity. From Nevers in the center of France to the estuary in Saint-Brévin-les-Pins, the inhabitants still have a strong connection with the longest river in France, each with local specificities. The river formed various landscapes, sometimes uphill, sometimes digging cavities, where long ago men found shelter before building homes. You might have the opportunity to sleep in a troglodyte bedroom after a day’s ride. Created in 1995, the “Loire à vélo” is a 800 km cycling route composed of small roads and greenways. If most of the network is on small roads, facilities and dedicated bike paths grow a bit more each year and help keep you away from traffic. Common to the Eurovelo 6 which links the Atlantic to the Black Sea, the “Loire à vélo” is one of the most popular and accessible bike routes. The low height difference is a real asset and first time cycling travelers often choose it as their starting experience. 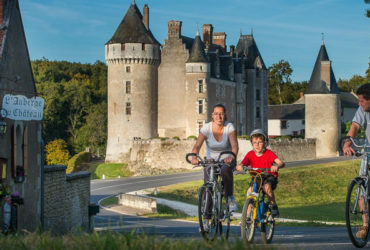 The network of cycling routes, greenways and large number of villages with hotels and bed and breakfast make it a great destination for families. The Loire Valley is much more than just a cycling route! All around the river, many roads and greenways take you to castles, vineyards and other attractions of the Loire’s rich heritage. Our trips show you the best of what the valley has to offer, along the official route and alternative local loops. We select our favorite sections and personally choose small roads and great pathways to not miss out on Loire Valley’s riches. 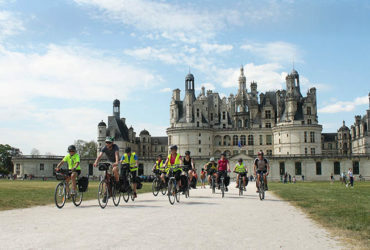 Accommodations have adapted to the popularity of the “Loire à vélo” by gradually developing services for cyclists. You can identify them by the Accueil Vélo accreditation, certifying their capacity to welcome cyclists and offer dedicated services. The Loire valley has a gentle climate you can enjoy throughout the year. Neither too hot nor too cold, temperatures are ideal for cycling. As they are very favorable for gardens and vegetable growers, the region has been nicknamed the Garden of France. The oceanic climate brings frequent cloudy periods yet the rainfall is below average. Its sunshine rate is average, with good temperatures from May to September. Summer has some stormy episodes; however you won’t experience torrential rain. Life is good here. It is no coincidence the Kings of France made it their residency of choice by setting up their court in Chambord, and in the entire valley from Nantes to Sully-sur-Loire. From Sully to Orleans: The Castle of Sully is a gateway to UNESCO’s World Heritage territory. In a bucolic countryside, along the riverbanks you cycle through beautiful small villages built around Romanesque churches, sometimes on the river. From Orléans to Beaugency: Out of Orléans, the Loiret flows into the Loire. Without a dam from its source to the ocean, many islands on the Loire show the river’s wild character. Some castles, in the heart of picturesque villages, offer nice surprises. From Beaugency to Blois: Welcome to the land of castles! Chambord, Cheverny, Beauregard, Blois, to name only the most commonly known. They carry you back in time, to the courts’ festivities and great royal hunts. 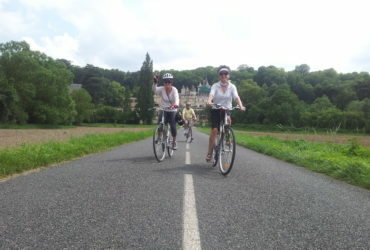 Cycling along the Loire offers a cultural amazement. 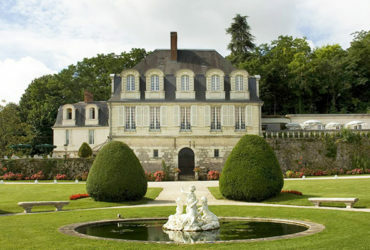 The Castle of Chaumont and its amazing garden festival! 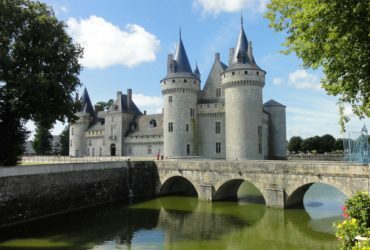 The Cher valley and the Castle of Chenonceaux: Spanning the river, the castle is magical. You can enjoy a canoe ride and navigate under the castle! 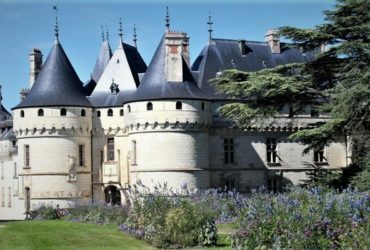 The Castle of Amboise and the Clos Lucé: Leonardo da Vinci’s last home presents some of the genius’s artistic inventions and creations. Touraine and its vineyards: Discover a wide variety of wines, some unknown yet delightful. Their bouquets and flavors are a perfect accompaniment to goat cheese, another one of the region’s specialties. Lush parks and gardens highlight the castles and mansions. From Chinon to Angers: the valley is wilder and more intimate. Castles are smaller, which gives them lots of charm. Tufa stone gives villages a rare luminosity. Commonly used in the Loire Valley Limestone has become expensive. Some preserved villages such as Candes-Saint-Martin and Montsoreau are among the “most beautiful villages in France”. The Loire separates and regroups into many branches, forming islands and sandbanks which are a paradise for birds. 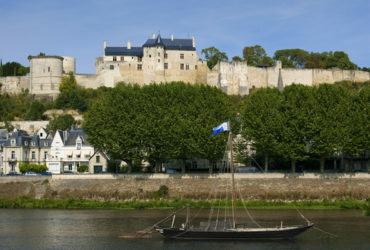 Saumur’s Castle overlooks the river and offers an exceptional view of the valley. Since 2011, the city organizes in June the Anjou Vélo Vintage, a retro bike race which now counts thousands of participants every year. The event has quickly become a must! From Angers to Nantes the Loire river widens. In some spots with vineyards, the river tightens and has stronger and deeper currents. From Nantes to Saint-Brévin, the country is flat and villages are scarce. You will soon reach the estuary and its salty sea scents. A place where waters mix, and cultures too!